Tenergy 05 announced the arrival of Spring Sponge Technology! Top international players around the world embraced this new development and the masses followed. Tenergy 05 Unique Spring Sponge Technology! 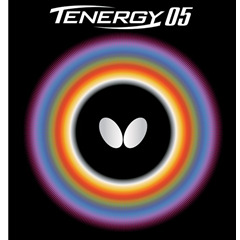 Tenergy is the flagship rubber from Butterfly and is used by many of the World's best players. Tenergy 05 rubber combines Butterfly's High Tension technology with their newly developed "Spring Sponge". This is an excellent rubber for the top spin player. This is the first rubber to feature Butterfly's new Spring Sponge. Spring Sponge feels hard yet its new technology allows it to hold the ball on the racket longer. Spring Sponge is produced by the unique format of air bubbles within the sponge and the thin pimples of the highly flexible surface, enabling dynamic topspin play with heavy rotation. Tenergy 05 combines this new explosive sponge with a new tensioned top-sheet with maximum surface grip. The result is a rubber that produces massive amounts of spin on serves and topspin drives. Tenergy is also one of the fastest most explosive rubbers in the Butterfly line, all without the use of any speed-glues or tuning. Tenergy will keep its speed throughout the life of the rubber without need for any special treatments. Tenergy 05 is best-suited for offensive all-round play. Within the Tenergy Family of rubbers, all styles of play can benefit from this new technology. Video: For additional details please view a recommended 3rd party video.